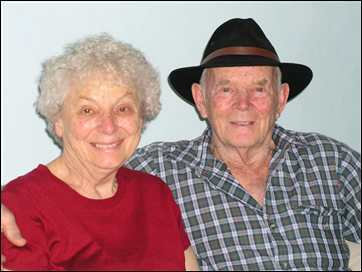 Buck & Betty Adams have been residents of Mosquito, California for more than 50 years. Adventurous, hard-working, and always ready to help wherever they see a need, these are two very special people. Buck's real name is Celian, but he never liked it. So he goes by several names, including Cecil, C.L., Buck, Buckwheat, and in Mexico, "Mister Adams," "Jefe" and "Chief." 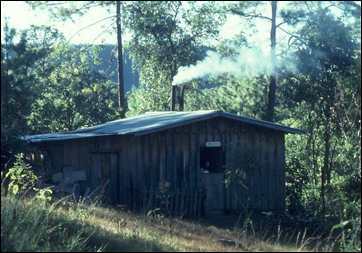 Celian's parents moved from Angwin, California to this log house located on 160 acres in Mosquito, back in 1938. 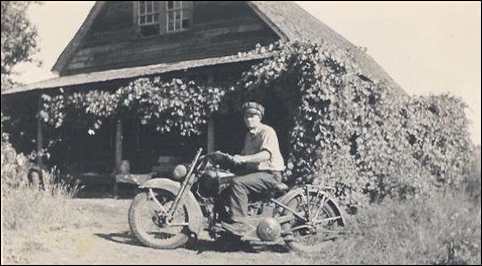 As a teenager Celian enjoyed riding (and at time racing) his Harley and Indian motorcycles. At age 85, he still rides! 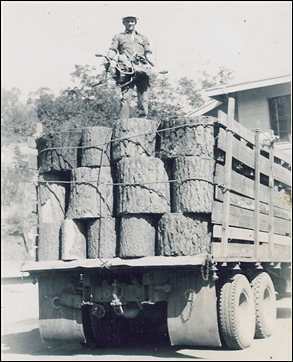 Celian married, had three daughters, and made a living by cutting and hauling veneer blocks to Sacramento and Stockton. 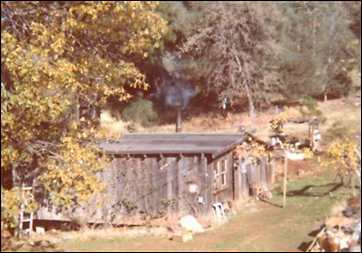 The family lived in a small cabin out in Mosquito, built using scrap lumber and square nails salvaged from a barbershop in the small mining town of Amador City, about 40 miles away. After eight years, the marriage failed. 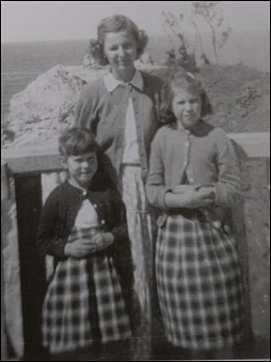 Youngest daughter Janet lived with her mom Marie, while Gloria & June (who went by Eileen & Ellen) stayed with their daddy and grandparents, Fred & Marjorie Adams. When Eileen was eight years old, she attended second grade at Camino-Placerville Junior Academy (now known as El Dorado Adventist School, or EAS). Her teacher was Betty Landstrom, who grew up in Redwood City. Eileen took a liking to her teacher right away, and within two weeks she asked if she'd like to be her Mommie. Betty didn't know how to respond - the poor girl had been without a mother for more than two years. So Eileen began telling her daddy that her teacher liked him, and vice-versa. Eileen did all she could to get her daddy to stop by the school, but Betty bashfully disappeared into the supply closet and kept busy until he left. So Eileen tried a different strategy. One day on the school bus, she told her friends that Miss Landstrom was going to marry her daddy! When reprimanded, she replied tearfully, "I was hoping it would come true if I told enough people about it!" During weekend programs at the school gym, the girls often sat with Miss Landstrom - in fact, five-year-old Ellen sat on Betty's lap. Eileen's relentless campaign eventually led to romance, as well as compassion for two little motherless girls. 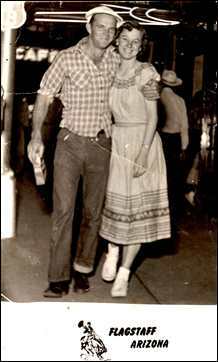 When school got out in June of 1954, Celian and Betty eloped, taking the girls with them. 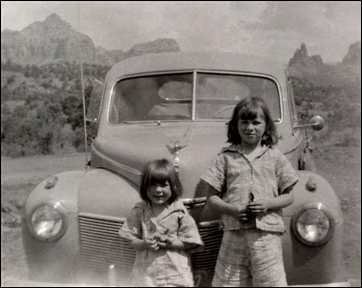 They traveled in this 1941 Mercury to Cottonwood, Arizona, leaving Ellen & Eileen with good friends Joseph & Maude Dye. Celian & Betty continued alone to Flagstaff, where Celian's relatives "Uncle Peanut" and Aunt Josie Bunten lived. Finding a Justice of the Peace in Flagstaff, Celian and Betty were officially married. There was a tense moment though, when the Justice asked Celian if he would take Betty as his wife. After staring up at the ceiling for the longest time - he finally mumbled something like "I do." It was July 1, 1954. They spent three days in Flagstaff, where a street photographer snapped this picture of the happy pair. It all happened so fast, Celian didn't even have time to tuck the box of crackers behind his back! Another day they drove the Merc out into the forest for a picnic. That's where Celian backed into something, making a dent in the rear bumper. Later, when they looked at the bumper, they had their first marital "disagreement." 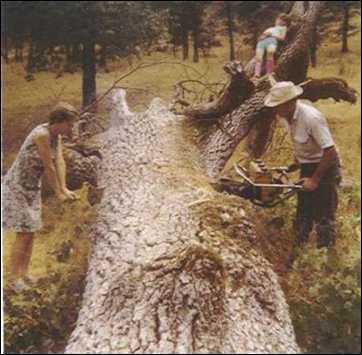 Betty was sure they had backed into a big rock, while Celian insisted it had been a stump. A year later, while traveling through Flagstaff, they made a detour to their previous picnic area to settle the argument. Sure enough, Celian was right - it was a stump! 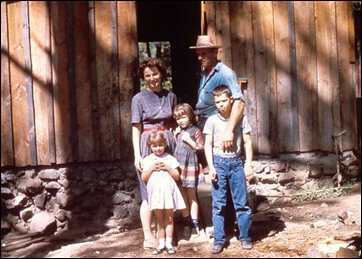 Back in California, the family eventually settled down in the old "Ranch House" on 120 acres in Mosquito. At that time, just a few dozen homes were scattered around the community. 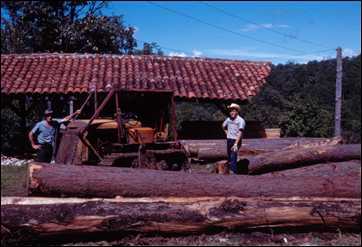 Celian got back to his logging business in the nearby forest, and Betty got out there with him, helping cut logs and veneer blocks with a two-man chainsaw. 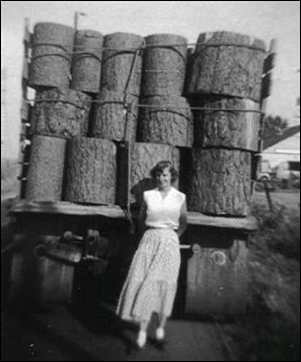 She also drove the logging tractor. What a change from teaching first and second graders! Besides working out in the woods, Betty kept busy turning the messy house into a cozy home, sewed cute outfits for the girls, and adapted to primitive country life. The first time she rode with Celian on the hairpin curves and swinging bridge of Mosquito road, she vowed never to go on that road again! Little did she know she'd be driving it hundreds of times in the next 50 years, and still drives it today. But the adventures were just beginning. In 1955, baby Freddie was born in Placerville. 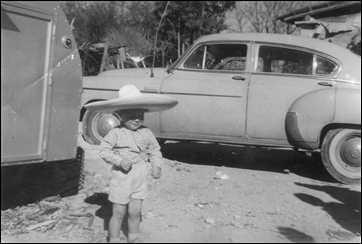 Then the family began making trips to Mexico, that led them 3,500 miles from their California home to Chiapas, located adjacent to Guatemala, in this green 1949 Chevy towing a Teardrop trailer. At first, Betty was scared to travel in Mexico - she'd heard stories about Pancho Villa. But soon she came to know and love the people of Mexico, many of whom still keep in touch to this day! The photo above shows Freddie at age two as the family visited friends in Oaxaca. High up in the mountains among pine and oak forests, nestled in a little valley, they found Colegio Linda Vista, a Seventh-day Adventist boarding academy. 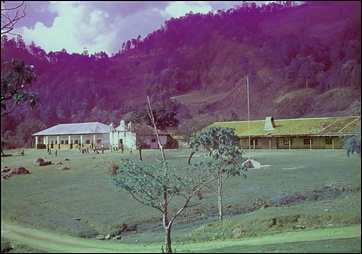 This little school was just getting established on an ancient Hacienda called Finca Santa Cruz. Sixteen students attended the first year, sleeping in the loft of the barn, attending classes and dining on the open porches of the building at the left. Teachers lived in tents and a makeshift lean-to. Right away Celian found ways to make himself useful, cutting trees, making lumber for new buildings, helping with mechanical repairs, etc. Juan Sors at right worked with him. Each year the Adams family returned to Linda Vista, each time staying a little longer, until eventually they spent the entire school year serving there as volunteers. Betty became a schoolteacher again, teaching English classes. 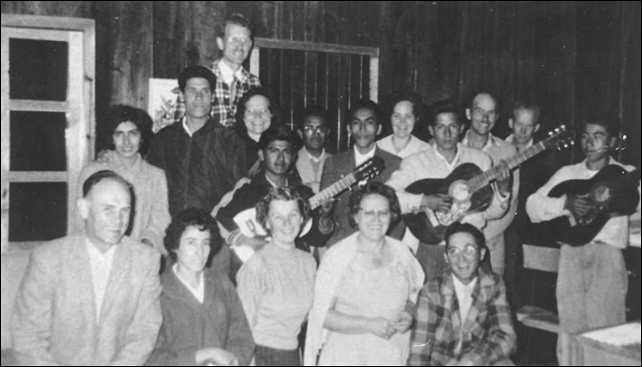 The above picture shows Linda Vista staff & some students in the late 1950's - Betty is in the front row third from left. School Director Horace Kelley stands tall in back. As the years went by, Linda, then Lanita became part of the Adams family. They enjoyed getting acquainted with many wonderful people, including Nicolacito Cruz, one of Linda Vista's first students. 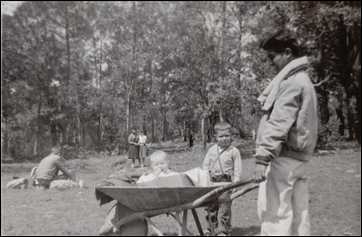 Here you can see him taking baby Linda for a wheelbarrow ride, with Freddie nearby. Further back, Eileen and Ellen stand watching. 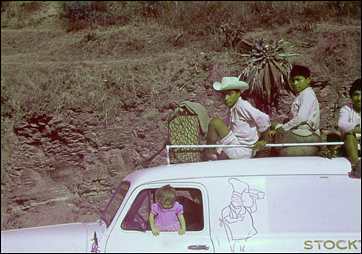 In the early '60's, the family acquired a 1953 Chevy bakery wagon, which made many trips between California and Chiapas. Often the native Chamula Indians hitched a ride on top. Baby Lanita stands in the window. Celian made many trips from Linda Vista to the city of Tuxtla Guti�rrez for cafeteria supplies, 80 miles away. The road was mostly dirt, mud and gravel. Each trip usually took two or three days. During their first visits to Linda Vista, the family camped out or slept in their Teardrop trailer. Sometimes they stayed with families on campus, as seen here with teacher Felipe Presenda. 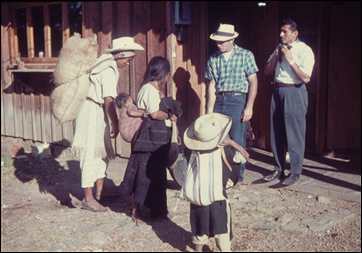 Native Chamula Indians often stopped by to sell home-grown produce, eggs, and wild berries. Here they are bartering for an old tire with which to make soles for their huaraches, or sandals. Eventually the older girls stayed in the U.S., and the rest of the family moved into a small cabin near the edge of the Linda Vista school campus. It was one large room, with a closed-off bathroom that had an actual flushing toilet in a corner. Here you see Betty & Celian Adams with their children Lanita, Linda and Freddie in 1965. At 5,000' elevation, the climate was ideal. Nights were chilly, so a fire in the woodstove kept the house cozy. The family cooked, baked and heated dishwater & bathwater on the stove. Friday nights we took our weekly baths - by hanging up a blanket for a blind, standing in a large galvanized washtub, and dipping hot water from a bucket to wash and rinse. Later they installed coils in the stove that heated water for a bathtub they obtained.